How Much? 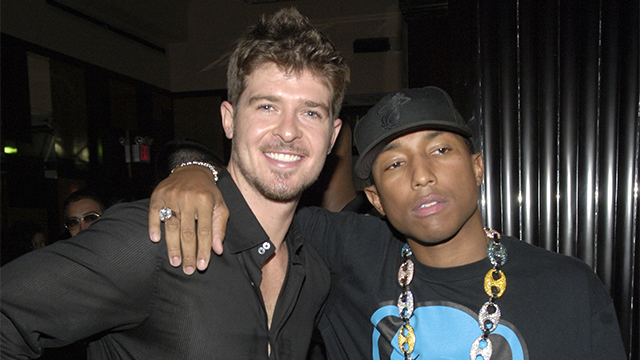 Court Testimony Reveals How Much Robin Thicke, Pharrell and T.I Made From The Hit “Blurred Lines”. - T.V.S.T. As we all know by now, Pharrell Williams and Robin Thicke are being sued by the estate of Marvin Gaye over the 2013 smash hit ‘Blurred Lines’. They are stating that the song is basically a copy of Gaye’s classic ‘Got to Give it Up’. Once the law suit went public, the similarities then became shockingly obvious to the causal listener. As part of the court hearing, the record companies had to reveal all the financial details of the recording, including how much it cost to produce the song and how much everyone involved made. Both answers left me amazed. And the rest of the profit went to the labels and distribution companies involved. The song was so big that The Creative Artists Agency attributed $11 million of Robin Thicke’s touring profits to that song alone. Meaning that they firmly believe that if Robin Thicke never released that song, he would have sold $11 million less in concert tickets and related merchandise. “I was high on Vicodin and alcohol when I showed up at the studio. So my recollection is when we made the song, I thought I wanted to be more involved than I actually was by the time. Pharrell’s defense is a bit more polished, he says that he grew up listening to Marvin Gaye and was trying to evoke the same feeling that Gaye’s music often made audiences feel. There are reports that some of Pharrell’s answers during his testimony were a little long winded and he was cut off several times by the judge. During the trial the jury also got listen to snippets of both songs played in the same key, however Gaye’s song “Got to Give it Up” was limited to how it could be presented in the court room. It could only be played as it appeared in sheet music. WILL THEY WIN OR LOSE THE CASE? At this point, it’s hard to tell. Before you roll out the pity party for Pharrell, Thicke and T.I., they could settle this case and move on with their lives. The trio is worth $80 million, $15 million and $50 million respectively. (Somehow I thought Robin Thicke had more coin than that). But I say if you are truly innocent, and Pharrell is truly talented, then fight for what’s right. That’s what the courts are for. What do you think? Do you think they will have to fork over some of that dough? Here is a mash up of the two songs, you tell me. INMHO…it sounds like they are in trouble. blurred linesMarvin GayePharrellpharrell williamsRobin ThickeT.I.